This Updated Condo is bright, clean and spacious! Steps from the beach, amazing restaurants, local attractions and the del mar race track. A large front patio has dining and seating to enjoy the breeze with a gas BBQ grill. This condo is located in Solana Beach and Tennis Club that offers an all year round heated pool, two hot tubs, and a club room with ping pong and pool, as well as tennis courts! A large skylight offers a natural brightness throughout this property. There is a queen bed in the master bedroom with dual shower heads in the master bathroom. The master bedroom also has a second patio with a lounger perfect for reading a book. The second bedroom has a trundle bed that can be used as a twin bed or pulled out for a king size bed. Washer and Dryer located in Unit with all stainless steel kitchen appliances. Beach towels and beach chairs included! 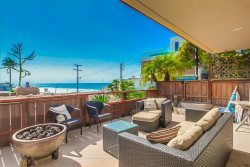 Located next to the Beach Walk Shopping center, Solana Beach Design District, Del Mar Race Track, and More! Parking will not be a problem with two dedicated parking spaces. Standard Amenities: Wifi, Fireplace, Outdoor Deck with Dining table, Patio, Balcony, BBQ Grill, Shared Hot Tub, Shared Pool, Beach access from the pool area, Jacuzzi Tub, DVD Player, Satellite / Cable, Television, Clothes Dryer, Fireplace, Internet, Iron & Board, Linens Provided, Living Room, Parking, Telephone, Towels Provided, Washing Machine, Coffee Maker, Dishes & Utensils, Dishwasher, Kitchen, Microwave, Oven, Refrigerator, Stove, Toaster, Full New Kitchen, Stainless Steel Refrigerator, Coffee Maker, Ice Maker, Microwave, Toaster, Cookware Living Linens, Washer & Dryer. Business Nearby ATM, Nearby Post Office, Nearby Internet Cafe, Nearby Bank Convenience Area Nearby Fitness / Yoga Centers, Nearby Medical Services, Nearby Grocery, Golf Course. *Children welcome, wheelchair inaccessible, Long-term Renters Welcome!